Ana de San Bartolomé (1549–1626), a contemporary and close associate of St. Teresa of Ávila, typifies the curious blend of religious activism and spiritual forcefulness that characterized the first generation of Discalced, or reformed Carmelites. Known for their austerity and ethics, their convents quickly spread throughout Spain and, under Ana’s guidance, also to France and the Low Countries. Constantly embroiled in disputes with her male superiors, Ana quickly became the most vocal and visible of these mystical women and the most fearless of the guardians of the Carmelite Constitution, especially after Teresa’s death. Her autobiography, clearly inseparable from her religious vocation, expresses the tensions and conflicts that often accompanied the lives of women whose relationship to the divine endowed them with an authority at odds with the temporary powers of church and state. 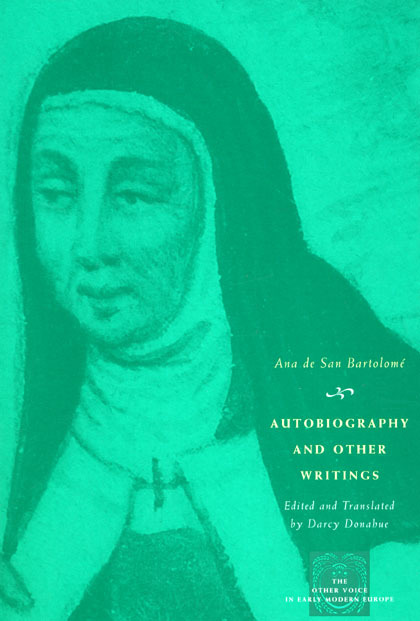 Last translated into English in 1916, Ana’s writings give modern readers fascinating insights into the nature of monastic life during the highly charged religious and political climate of late-sixteenth- and early-seventeenth-century Spain. A. "An Account of the Foundation at Burgos"